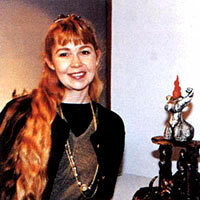 Martie Geiger-Ho earned a Ph.D. in fine arts interdisciplinary at Texas Tech University, Texas, August 2003. Her dissertation “Pathways of Transmission: Investigating the Influence of Chinese Kiln God Worship and Mythology on Kiln God Concepts and Rituals as Observed by American Ceramists” is an ethnographic study of the worship practices associated with the ceramics industry in Jingdezhen, China. In 1994 she received her M.F.A. in ceramics and painting from Texas Tech University and an M.A. in ceramics and sculpture from the University of New Mexico in 1987. She began her art career as an arts and crafts specialist in the United States Army (1974-77). Prior to becoming a full-time artist, Geiger-Ho work as assistant professor of art and taught ceramics, sculpture, mixed media, painting, design, and art history at the University of Brunei Darussalam (2012-18), University of Pittsburgh at Bradford (2009-11, 2003-07), Hong Kong Baptist University (2007-09), Mississippi University for Women (2001-03), Hong Kong Polytechnic University (1998), Chinese University of Hong Kong (1998-99), City University of Hong Kong (1998), The Pottery Workshop (1997-98), Hong Kong Museum of Art (1997-98), I-Kiln Studio (1997-99), Chautauqua School of Art (1995-96), and Gustavus Adolphus College (1995-96). Geiger-Ho co-founded Hong Kong Mural Society (HKMS) and I-Kiln Studio in 1997. She organized the first large scale raku project in Hong Kong with the grant support from the Hong Kong Arts Development Council, and co-directed the pilot public housing mural project and muralist-in-schools project in Hong Kong (1996-99). During her expatriate life in Hong Kong and Brunei, she participated in many local, invitational and juried exhibitions, and received several fellowships and research grants from universities and arts councils. Geiger-Ho participated in more than 90 regional and international art exhibitions including 16 solo exhibitions. Her artworks have been exhibited in venues such as Museum of Tianjin Academy of Fine Arts, Guangdong Museum of Art, San Angelo Museum of Fine Arts, The Museum of Fine Arts (Santa Fe), Kunstquartier Bethanien, Manitoba Crafts Council Gallery, Hong Kong Visual Arts Center, Hong Kong Arts Center, Museum of Site, University of the Philippines Visayas, Poh-Chang Academy of Arts, University of Brunei Darussalam, University of Pittsburgh at Bradford, Keystone College, Mississippi University for Women, Delta State University, Gustavus Adolphus College, Texas Tech University, University of New Mexico, Cameron University, Chautauqua School of Art, Hong Kong University of Science and Technology. Her ceramic work has been exhibited and collected in the United States, Hong Kong, Brunei, China, Japan, Thailand, Philippines, Canada and Germany. Her book, The Worship of Kiln Gods: From the Temples of China to the Studios of Western Potters, was published by Outskirts Press, July 2012. Geiger-Ho has published several peer-reviewed journal articles, including “Under the influence of the “Great Mother” archetype: Photographing raw clay Bruneian landscapes through an ecofeminist lens,” The International Journal of the Image, Vol. 7,No. 4, 2016; “Teaching and making art, and cultural context: Kuwait and Brunei,” Teaching Artist Journal, Vol. 13, No. 3, 2015; "Guardians of a shifting industry: Worshiping the kiln god, Lo Ming in Yingge," Ceramics Technical, No. 39, 2014; "Origins of kiln gods," Ceramics Monthly, Vol. 61, No. 8, 2013; "Playing with fire and kiln gods," Ceramics Technical, No. 24, 2007; "Guardian's of fire and clay: The legacy of Chinese kiln gods," The Studio Potter, Vol. 28, No. 2, 2000.